A New Method of Macarony Making, As Practiced at Boston in North America, Carington Bowles, 1775, University of Wisconsin Digital Library for the Decorative Arts and Material Culture. From the beginning of this project, I have been searching for a high resolution copy of this print, and finally I have stumbled across it! The University of Wisconsin's Digital Library for the Decorative Arts and Material Culture has faithfully reproduced this rare image. 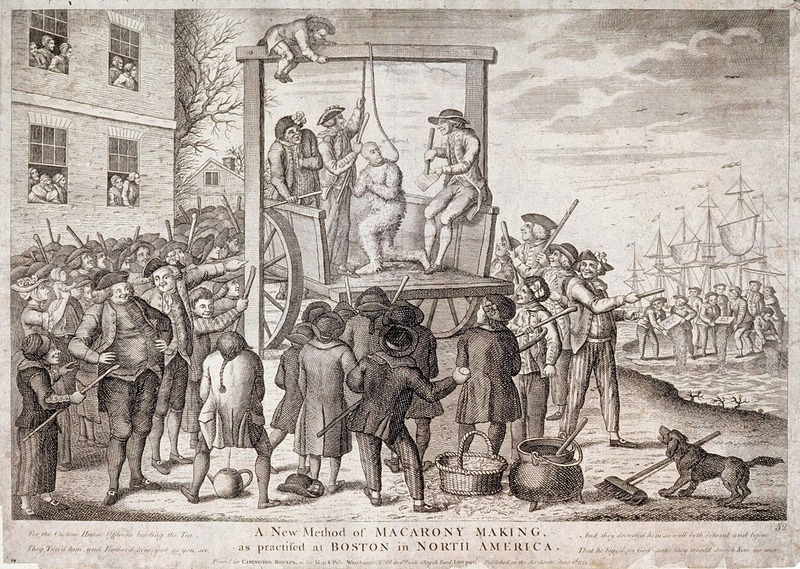 Even to an eye only somewhat familiar with political cartoons of the American Revolutionary era, the central figure (covered in feathers, bent on one knee and begging to be released from the noose fitted about his neck) is an obvious copy. Even the title has been lifted from a popular piece that was published only a year before. Unlike many lazy attempts to cash in on popular prints by reproducing the exact same print (only worse), Bowles used only the central figure of the original and expanded the rest of the scene dramatically. For the Custom House Officers landing the Tea ; / They Tarr'd him and Feather'd him just as you see, / And they drench'd him so well both behind and before / That he begg'd for God's sake they would drench him no more. Sure enough, we find the begging Tory at the feet of American tars. 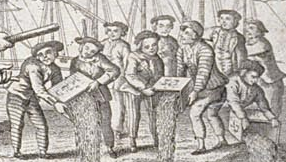 Perhaps taking his cue from John Adams famous description of the Boston mobs as "a motley rabble of saucy boys, negros and mullatos, Irish teagues and outlandish Jack tars," Bowles illustrates a black and a white sailor. 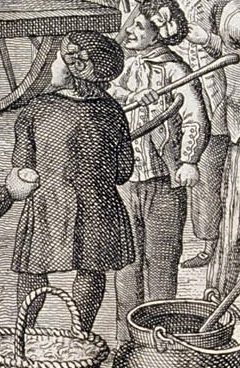 The seaman on the right wears a knit cap (possibly a thrummed cap) decorated with a large cockade. His dotted neckcloth hangs over a striped waistcoat, beneath a fairly typical single breasted short jacket. His mate, ready to haul the Tory aloft by his neck, also wears a dotted neckcloth, but has much fancier headwear: a cocked hat with large cockade and lace tape. Perhaps further indicating his position as a leader among the violent mariners, his jacket is also lined with tape around his cuffs, waist pockets, and lapels. A plain waistcoat is fitted beneath, and a simple pair of trousers complete his slop clothes. To the far left in the foreground is a short sailor, perhaps a lad. He wears a round cap, probably a knit cap judging by the stripes. His jacket is very short, barely extending past the waist, with mariner's scalloped cuffs buttoned closed. Otherwise he wears striped slops, a solid color neckcloth, and striped slops. Amid the crowd, right at the foot of the gallows, is a sailor heaving a stone at the helpless and prostrate man. His is a short brimmed round hat. Over his triple vented jacket is tied a dark neckcloth bordered in a lighter color, and beneath it is a pair of close fit striped trousers. Along with many of the other jacks, he carries a stick or cudgel. 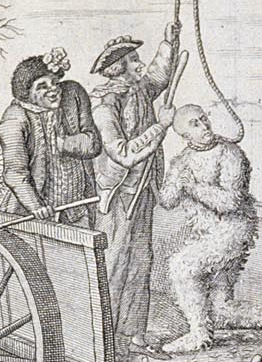 Smiling as he watches the scene beside another Bostonian (probably not a sailor judging by his hair length, frock coat, and stockings), yet another tarpawlin wields a cudgel. Another thrummed cap with cockade, just like that worn by the black sailor, is visible here. His jacket is also lined with tape, but is double breasted. A white neckcloth, striped waistcoat, and plain trousers finish him off. 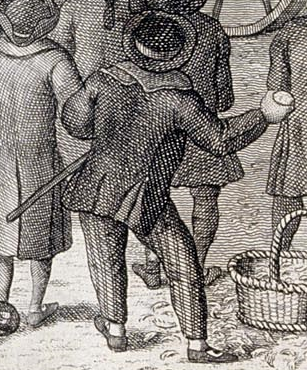 At the far right of the crowd another sailor gestures toward the Boston Tea Party. 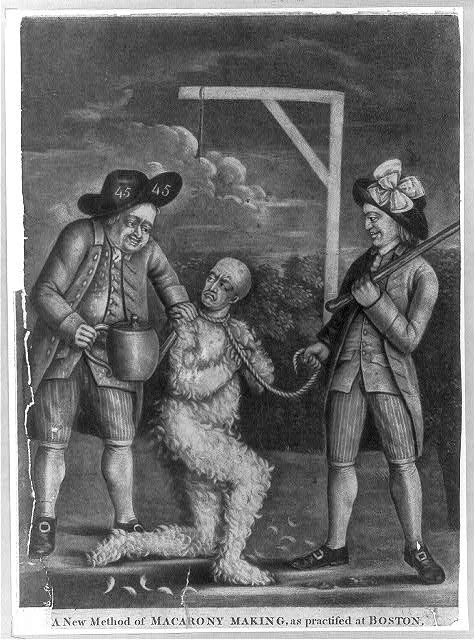 The infamous December 1774 event did not occur alongside a tar and feathering, but this sailor may be a visual key by the artist to indicate how the chronologically separate events are linked through the same violent rabble. Regardless, this sailor wears a cocked hat with the point forward and a large cockade, a solid colored neckcloth, short jacket with no waist pockets and trimmed around the cuffs and armscye, single breasted waistcoat with stripes that only appear straight down the front along the buttons stand, and a pair of striped trousers. The Tea Party participants have foregone their Indian garb in favor of sailor's clothing. Trousers that areplain, horizontally striped, and vertically striped, accompany short jackets with slash cuffs and, in one case, even a striped jacket. 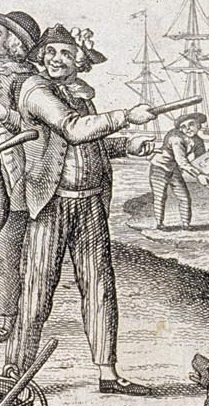 Striped jackets are mentioned here and there in textual accounts of sailors, but rarely turn up in art depicting them. What's great about this piece is that this sailor is not the only one with a striped jacket. Hatless, he too wears a striped jacket, accompanied by plain slops.